When you buy a medical ID, we know you're not just buying a piece of jewelry, but peace of mind, independence, and security. It is important to choose an established company that can provide the service that you, your family, and the community deserve. We know you have a choice and we hope it is American Medical ID. Our story began in the early 1990s when our Founder & CEO, Rick Russell, was working as a pharmaceutical sales representative. 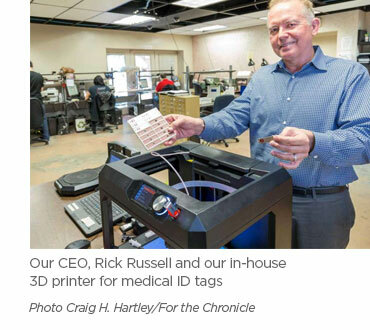 Rick noticed how available medical ID style options were extremely limited and not likely jewelry that patients would want to wear every day. He knew if someone could develop more attractive designs, physicians, nurses and pharmacists would be better able to convince people to wear these life saving devices. Wearers would feel safer and actually experience peace of mind, whether for themselves or a loved one. In 1994, American Medical ID was born. Today our company makes ID bracelets and necklaces as high-quality pieces of hand engraved and hand assembled jewelry. We even have a certified jeweler on staff to provide guidance and expertise when selecting our products and to answer customer questions. Our company's vision is to have an emergency ID on every person - empowering people to retain personal independence and continue to engage life to the fullest with confidence and peace of mind. We believe that a business is only as strong as its employees. In 2003, other companies started to express interest in buying our company and as founder, Rick Russell was primary owner. Instead of selling, Rick decided to invest in his employees, those who had built the company, and adopted an ESOP - Employee Stock Ownership Plan. Today American Medical ID is 100% employee owned and operated. Our employee owners are driven by our passion to build a great company and for making the biggest difference we can in the lives of our customers and the healthcare industry. About 50 of us happily work in our 8,000 square-foot facility in northwest Houston, TX, with a third of our employees having been here for over ten years. American Medical ID works with several partner organizations and institutions that allow us to serve diverse members of the community. Through partnerships with the American Association of Nurse Practitioners and many other professional organizations, American Medical ID is dedicated to remind and educate the medical community on the importance of wearing a medical ID. Highly regarded institutions cite the importance of medical IDs. Some examples are the American Diabetes Association, Mayo Clinic, Alzheimer's Foundation, Centers for Disease Control, Cleveland Clinic, Texas Heart Institute, VA, Johns Hopkins and more. We also understand that not everyone has the means to buy a medical ID, so we initiated a program that allows every doctor to request a medical ID, free of charge, to a patient in need. With a note or prescription signed by a physician or nurse we will fulfill this request. In 2010, American Medical ID donated one million blood pressure tracking cards to the Nurses Organization of Veterans Affairs (NOVA). This donation is a natural extension of our philosophy and philanthropic efforts, especially for those that have sacrificed so much for our nation. Since 2012, we have had an ongoing relationship with the Veterans Administration as an approved vendor passing a rigorous qualifying process. We now work with VA hospitals, clinics and other locations across the US and have a contract on the Federal Supply Schedule to help them carry out the 2009 directive from the Department of Veterans Affairs; which is to make ID bracelets and pendants available to eligible veterans - free of charge. Every year, thousands of veterans benefit from this amazing program. Since 2007, American Medical ID has been partnered with Mended Little Hearts to help children, young adults and their families that are affected by congenital heart disease. We have trained Mended Little Hearts family members on what to engrave on their child's medical ID and we continue today to explore ways to raise awareness and support for those with heart defects. For instance, in 2016, Mended Little Hearts was chosen as the benefitting organization of our annual "Buy One and We'll Give One" campaign. For every medical ID purchased during the holiday gift buying season, we will donate a medical ID to one of their members. In 2012, our company began selling a special edition medical alert ID that incorporates an Autism Speaks awareness bracelet. A portion of the proceeds are dedicated to funding research into the causes, prevention, treatments and a cure for autism. We hope that through this program, we are able to help increase awareness on autism spectrum disorders and advocate for the needs of individuals with autism and their families. American Medical ID is a national affinity sponsor of the American Diabetes Association. Since 2007, we've worked together in a variety of ways, including the creation of a custom engraved ADA® medical ID bracelet. When you purchase your ADA® bracelet, a portion of the proceeds will be donated to the American Diabetes Association to help support its mission and reach more people who are living with diabetes. Whether you need help in choosing an ID, assistance with engraving, or placing your order online - it is always our sales team's pleasure to help. Were' here to serve you. "In a world where customer service is dying, American Medical ID still shows appreciation for their customers." "My experience with American Medical ID was awesome, I was helped by a real Pro. She was polite, well-mannered and she knew what I wanted and my needs were solved in a matter of minutes." "My American Medical ID bracelet took me through TSA & airport system with more confidence. A nice way to start one's vacation. Thank you American Medical ID!" We also take pride in receiving feedback about the high quality of our products and how they help improve our customers' quality of life. "My husband received his new ID bracelet and we were pleasantly surprised of the high quality. We replaced his old bracelet that was smaller and this one handled all the information that he needed since it had to state that he had a stem cell transplant and needed irradiated blood if a transfusion is needed." "It is comforting to know that in an emergency he will be given the correct treatment." "My Lynx Noble ID bracelet was delivered in its little red pouch. I could not be happier with the quality of this item. This stainless teel gold and silver toned bracelet is beautiful and stylish. It will be your wisest investment. It may save your life one day." Our satisfied customers have been generous in sharing with us how American Medical ID has touched, changed and even saved their lives. These stories and testimonials are one of our best assets that encourage us to do what we do best, to save lives on medical ID at a time.